Rocky Nicholas with his parents at their Kangemi home. 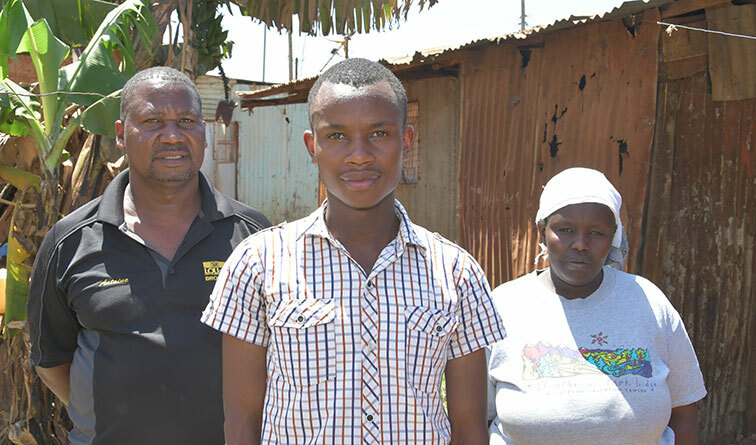 Rocky, a Macheo beneficiary from Oasis Secondary School, scored a B- in the 2018 KCSE exams. It started as a dare game between two young brothers. Who, between them, would light the largest fire? “No, I will,” interjected the other. Meanwhile, Husna Musa, oblivious to what her younger brothers were up to, was fetching water for the household. Her neighbours alerted her that their house was on fire. Forgetting the need for water, she sprinted home only to be welcomed by the sight of their family home razed to the ground. This sent them to the forest for four days and nights. Left with absolutely nothing but the clothes on their backs, a paternal uncle took them in. However, the family had to share a room with the newest member of the household: a cow. Her father eventually managed to build a one-roomed house using six pieces of iron sheets. Here, they began the process of reconstructing their lives. “We had a string of problems, one after the other. I continued going to school. We could barely afford school uniform; mine was in tatters,” she continues. Her maternal grandmother came to the rescue and took her in. Her grandmother’s mud house, located in Kibra, the largest slum in Nairobi, has been her home since she was in Class 6. The slum residents, the majority of whom live in extreme poverty, have to contend with lack of basic commodities; clean water, sanitation facilities and proper housing. Husna completed KCSE in 2018 and was the second best student with a B- grade at Kibera Girls Academy. It is in this school that she got the opportunity to join Macheo in 2016 while in Form Two. The Macheo Achievement Programme is an education and mentorship programme run by Strathmore University. It empowers secondary school students from disadvantaged backgrounds to excel in their academics, develop character and access opportunities to join university and other tertiary institutions. Currently Macheo has 150 students, located in three different slum areas in Nairobi – Kibera, Mukuru and Kangemi. In last year’s KCSE exams, the students in Macheo posted impressive results. Out of the 43 Macheo candidates who sat for the Kenya Certificate of Secondary Education (KCSE) exam in 2018, 42% got a C+ and above and qualified to study degree courses, with 28% qualifying to study diploma courses and the other 30% certificate and TVET courses. “We had teachers from the top schools in Nairobi teaching us on Saturdays. We also had mentors who encouraged us, and reminded us of our dignity as individuals, regardless of our background,” Husna recalls. Another student from the 2018 Macheo cohort is Rocky Nicholas. He sat for his exams at Oasis Secondary School located in Kangemi, an informal settlement in Nairobi. He, too, scored a B- and was the best in his school and in its environs. He is now back at the school, giving a hand at teaching Mathematics and Chemistry. Rocky joined Macheo while in Form Four in 2018 as a replacement, after a classmate dropped out of the programme. The one year he spent at Macheo pushed him to study harder than he already was doing. “I had a mentor who I would talk to about my studies and personal life. He encouraged me to work hard. It was hard staying focused, coming from a humble background, without sufficient study resources and from an area where education is not highly valued. Macheo helped me stay on track,” Rocky begins. For both Husna and Rocky, raising school fees for their high school education was an uphill task. Rocky’s parents run a food kiosk, the business that has put Rocky through school. “I used to work as a watchman until one day I was laid off. I had to think of ways to sustain my family. We had to make the sacrifice of making our living space smaller so that we could incorporate the hotel into our house,” his father says. This meant walking through the alleyways of Kangemi where crime is rife in darkness. “I had to do this. How else would I keep up with school work?” he asks. Husna’s grandmother is a witness to the young girl’s determination to stay in school despite the odds. “What do you do with a child who comes home with good grades and has the desire to continue with her studies? The amount of money needed for her university education is beyond me,” she asks. The two young achievers would like to pursue a Bachelor’s degree in Commerce at Strathmore University. This degree will be the first in their families. “I have seen my parents struggle to pay my school fees. At times I would get discouraged and entertain thoughts of giving up. Through this degree, I would be in a position to support my parents financially and help them educate my two younger sisters and brother. I would also like to start a foundation in my neighbourhood that will emphasize the importance of education,” says Rocky. Husna has had to live away from her parents and siblings though she occasionally visits them. She, too, would like to be a support for her parents in order to uplift their financial status. And knowing the struggles girls in slums go through in order to finish school, she would like to fight for their rights. “Many in our area do not support the education of girls because they say we will eventually get married. Out of the 60 girls who were my classmates in primary school, only three of us have completed secondary school,” she says.